In a previous article on communications while traveling, I recommended the T-Mobile prepaid plan. I think that it is the best plan for the frequent or infrequent traveler to the US. In my previous article, I noted that I think the best plan for most travelers in the T-Mobile prepaid daily plan, but the pay by the minute or monthly plans could be good solutions for some people. I personally do the $2/day plan that gets me unlimited calling, text and data (at the slower Edge speed). I am currently on a 11 day trip traveling to Dallas and San Francisco and I thought I would share some of what I have learned by using my US phone outside of my normal usage patterns. 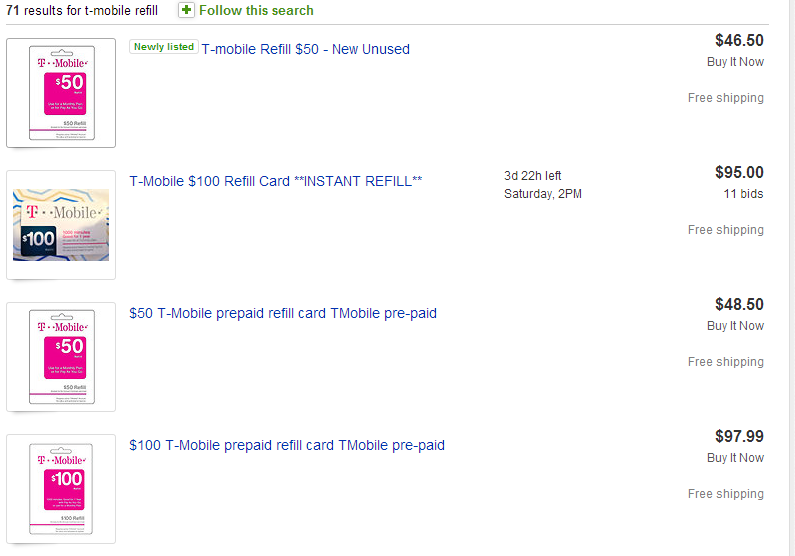 T-Mobile refills can be bought at pretty much any retail establishment or you can refill your account by calling T-Mobile directly from your prepaid phone and giving them a credit card number. Google around for coupons that get you 10% off. They are available regularly. My experience was that the billing address verification could not complete so the transaction was cancelled. I was requested a water or cable bill to prove my residence to make the $10 purchase. Likely not worth the effort. Buy Staples gift cards or Staples rewards from eBay or other places where you can get a discount and use those gift cards to buy your refills. Staples gift cards usually sell for about 10%-15% discount on eBay so you will save a larger percentage. My T-Mobile SIM card has a Boston phone number connected to it. When I was in San Francisco, I was in a text messaging conversation with someone right around 9pm when my text messages stopped going through. After I reassessed what happened, I realized that my day of usage ended at midnight EST, which was 9PM PST. Empirical evidence indicates that the T-Mobile calculates your day as midnight to midnight in the time zone where your phone number is based. In reality, what this tells us is that we have the option of having our clock be from midnight to midnight EST by choosing a a number in the eastern time zone. We could also make our daily clock be from 3am – 3am EST by choosing a number in the pacific time zone, or from 6am – 6am EST by choosing a number in the Hawaiian time zone (area code 808). For me, personally, I currently live in the Eastern time zone and most of my time is spent in the eastern time zone. However, when the clock strikes midnight, I don’t really consider it a new day. I usually consider it a new day when I wake up in the morning around 7am. Ideally, for me, I would want my T-Mobile day to be calculated at 6am – 6am EST. The day that I make a road trip to Buffalo NY might have me entering the US at 10am but not coming back until 2am. I believe that most people would probably benefit from having a phone number from a more western time zone, assuming they treat their travel days the way that I do. If you are in the western areas, it is probably even more imperative to have a phone number from the western time zone so you don’t have your phone stop working at 9pm (PST), as happened to me. For daily plans on T-Mobile, it appears that a new day starts at midnight in the time zone that the phone number is based. Choose your number accordingly. Further west would likely benefit most people. My dad and his friends (all Canadian) went to New York for a few days and decided that they would communicate with each other by calling each other. 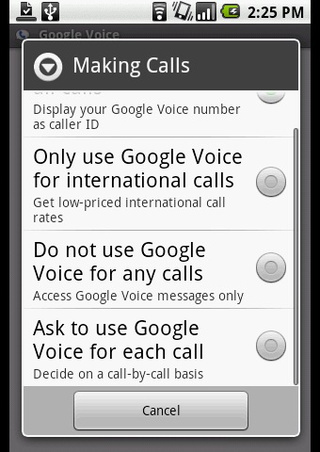 I had set up Google Voice as the default method to route all calls so he could call Canada or US numbers for free but those settings were changed when the SIM card was reactivated. As a result, all of his calls were charged the $.49 / minute to Canada. In total, for the 1 day, I am willing to bet that they spent about $50 or more in phone calls between the 4 of them. Avoid the $10 charge at T-Mobile stores. As I mentioned, I am on a 11 day trip to the US. Given that I am on the $2 / day plan, my cost for the cell phone usage is going to be $22. I recently discovered that if I were to stay for a few days longer, I would be better off taking a $30 / month prepaid plan. This monthly $30 plan is actually slightly better for many people’s usage and it reduces your costs if you are in the US for more than ½ the month. There are 2 versions of the $30 / Month plan. If you use any significant amount of data, then the $30 / Month plan with data is the one to go with. You limit your voice minutes, but using the apps I suggest for Android or iPhone, you can make your calls use data instead of minutes. This would mean that your voice minute limitation would be irrelevant. 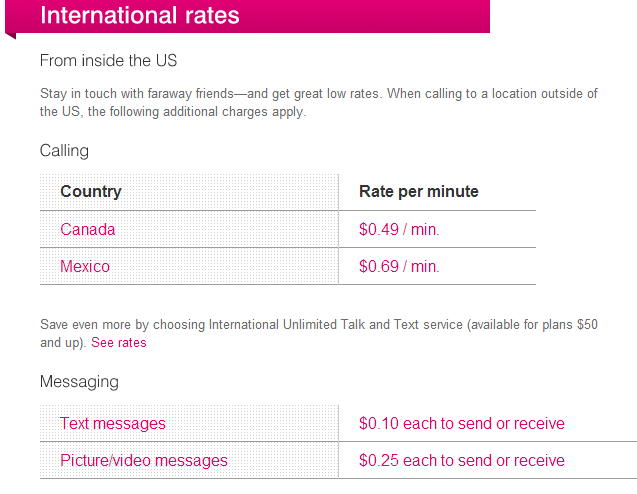 Here are a few insights I had on saving some money when using a T-Mobile prepaid phone plan when traveling to the US. Don't subscribe All Replies to my comments Notify me of followup comments via e-mail. 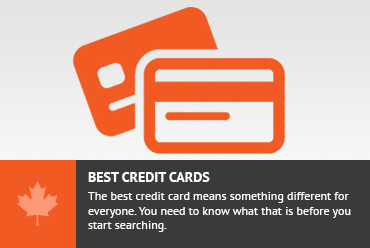 You can also <a href='https://www.creditwalk.ca/comment-subscriptions/?srp=1252&srk=2648578ecea05c83754707575dc5a494&sra=s&srsrc=f'>subscribe</a> without commenting.